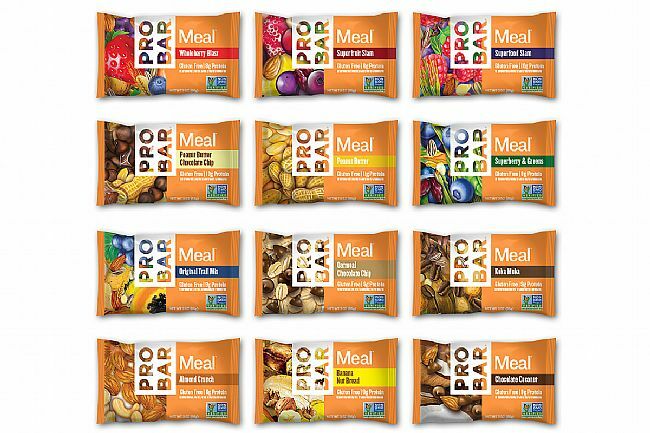 Made using non-GMO fruit, nuts, and seeds, PROBAR's Meal Bar provides a delicious, nutrient-dense meal that fits in the palm of your hand. With more calories than most other bars out there, carrying these around saves room in your pack and provides easy access to energy, protein, fiber, and Omega 3 and Omega 6 fatty acids. If you're starting to fade and don't have the time or inclination to stop for food, eat a Meal Bar to fuel up or split one for a needed boost. The Meal Bar Mixed Pack (Box of 12) contains One each for a total of 12 Bars: Original Blend, Whole Berry Blast, Superfruit Slam, Superberry & Greens, Almond Crunch, Koka Moka, Chocolate Coconut, Peanut Butter, Banana Nut Bread, Oatmeal Chocolate Chip, Peanut Butter Chocolate Chip, and Superfood Slam. Simply delicious and my favorite snack. Perfect pick me up for long training sessions or long hours at work.